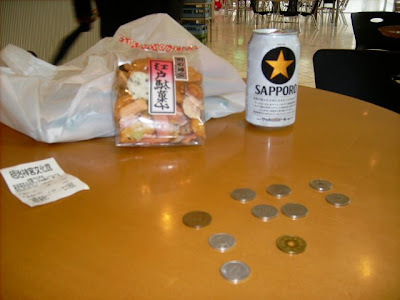 About a month ago, I posted about a friend who was preparing to go to Tokyo on a business trip. Well, Deron Richens went, ate and conquered. He learned that you'll never go hungry in Tokyo. 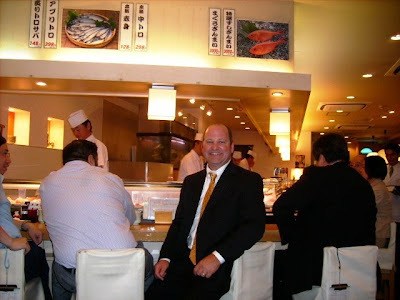 Deron kindly agreed to be a guest blogger on RawFishionado, to share his food experiences, in particular, with us. His delightful account, in text and photos, follows. Reading it may inspire you to book the next flight out to Japan. When I was asked to go to Tokyo by my company for meetings with our joint-venture partner, I honestly did not think of Tokyo as a Top-10 world destination for me. I planned on flying out, doing the meeting, then coming home. However, my wife made me book a couple of extra days to sightsee, even though it would keep me away from the family for a week. I am very glad she nagged me to stay longer. To give you the short and skinny about Tokyo: it’s New York times 10, except cleaner, more efficient, less smelly and more courteous. New Yorkers don’t fret - I still love NYC. 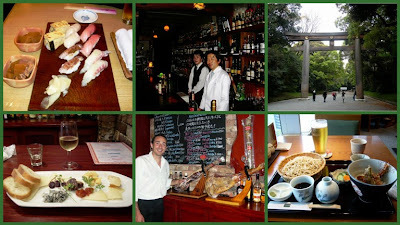 What follows is a gaijin’s culinary tour of a great city. 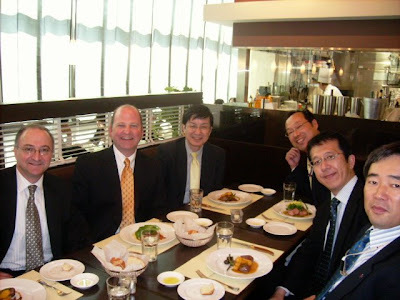 Our Japanese hosts catered to our western palates by taking us to American, French and Italian restaurants. What I found was that most restaurants have set menus, and you can choose between a couple of items for each course. Excellent! 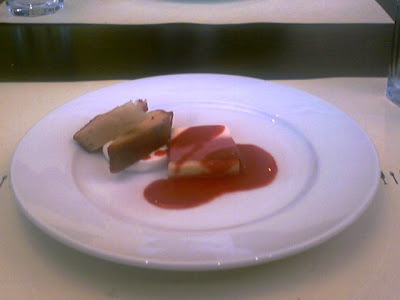 There was much pride and skill displayed by the chefs at this and all the restaurants I visited. 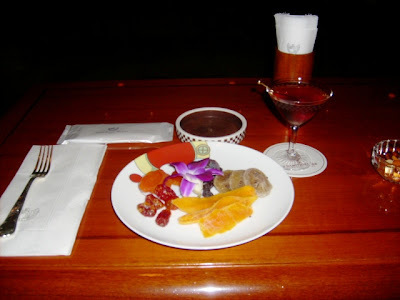 After the Italian dinner that night, I told my English-speaking host that although I had been in Japan for two days, I hadn’t had sushi or seen the world-famous cherry blossoms, which only appear for a short time during the year. Off to the 24-hour sushi bar! 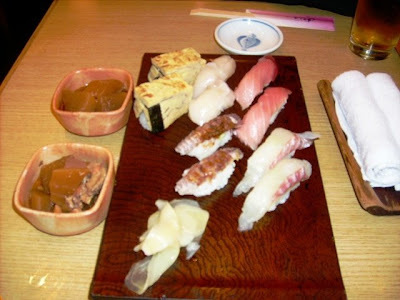 Late-night snack of tuna, snapper, sweet shrimp and mackerel. My host told me that he likes to order the egg sushi when trying a new sushi bar. He told me it’s like ordering the minestrone and the carbonara to make sure an Italian chef knows the basics. The next night I was on my own, and headed over to the Ginza Corridor, which became my favorite street. 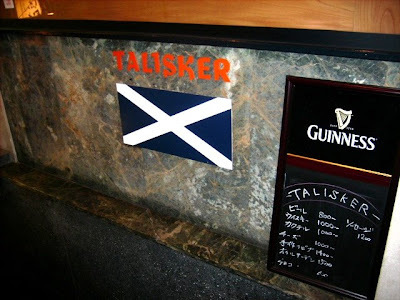 It's right behind the Imperial Hotel and is loaded with all kinds of bars and restaurants. A side note about Tokyo: if you don’t like sushi or raw things, no worries - there are so many choices, even the pickiest American can eat well here. Above is the Shabu Shabu restaurant I went to. Mmmm ... meats. 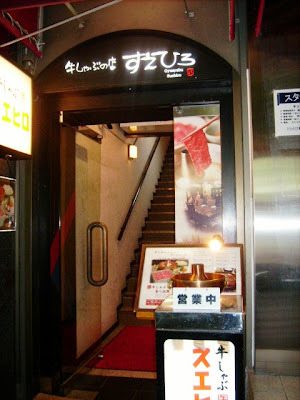 All-you-can-eat for 2,800 yen ($28) - meats, noodles, vegetables, etc. After a slow, steady gorging at Shabu Shabu, I wandered the streets of Ginza, taking pictures and basically being a tourist. Then I stumbled upon drinking heaven. This sign and a dark staircase was all I saw at street level - so I headed down. 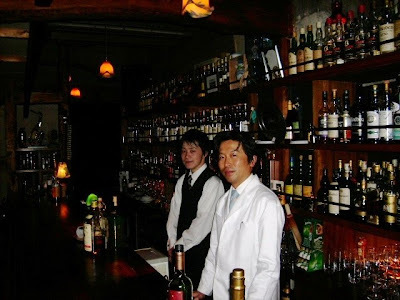 This amazing little 10-seat bar had the largest collection of scotch whiskey this side of Zanzibar - close to 8,000 bottles. And the precision and effort that these two craftsmen put into a drink was remarkable! God bless bourbon. 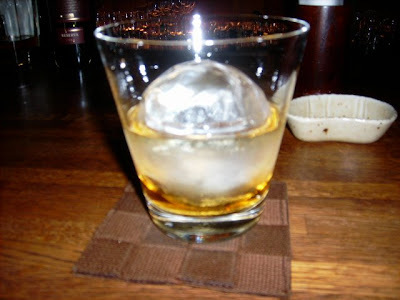 And yes, that is an ice-cube ball, the best part of the drink. What a beautiful thing. On to the Imperial Bar, which is a redo of the original bar designed by Frank Lloyd Wright, way back when. Mr. Wright designed the original hotel, which was quite the place to see royalty, celebrities and the well heeled. Fun fact: The woman who created the Barbie doll lived at the Imperial for a year in 1957, when she was brainstorming the idea for the doll. She basically hung out in the lobby, watching the hoi polloi go about their business, to get clothing ideas for Barbie. Now this is a late-night snack and beverage. What you have here is mixed dried fruit with a Manhattan. I feel like royalty. 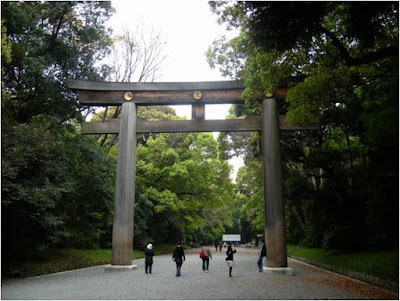 The next day was spent exploring the city, in particular the Meiji-jingu Shrine in the Shibuya section of town. Then I needed a snack. 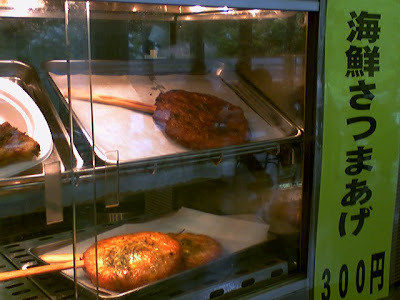 Mmmm ... meat on a stick. Gotta wash it all down. I love that you can buy a beer out of vending machines in the park. After a great morning in the park, I needed to eat again - imagine that! One thing I loved about Tokyo is that all the major department stores have restaurants. I’m not talking about American franchise fast-food crap that we all love over here, but real, sit-down restaurants that rock. 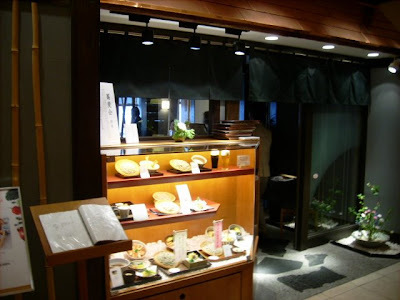 This quant little place was at the top of the Takashimaya department store. Great food and a view. I love meals like this that have a bunch of different tastes. While I couldn’t read a thing on the menu, pointing and nodding did me well. 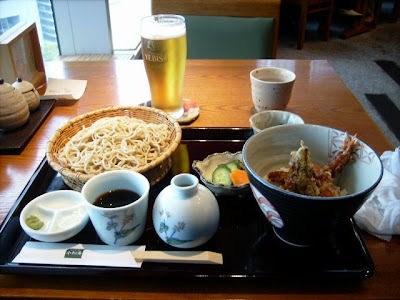 I enjoyed delicate tempura, cold soba noodles, pickled cucumbers and some unknown vegetable. The waitress told me the sauce in the cup is for the soba. Later in the day, the snack monster attacked, so I stopped by a bakery on the Ginza Corridor. Don’t know what these were, but they were good and sweet! Because almost all signs are in Japanese, I sometimes didn’t know what I was eating. But I wanted to be adventurous and try different things, so I dove right in. 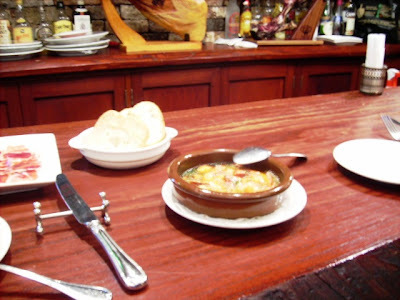 That night, I stopped by a Spanish tapas bar I had seen the night before. Good choice, Deron-san. Have you ever wondered where prosciutto came from? That is the hind quarter of a pig that has been salt-cured into prosciutto. 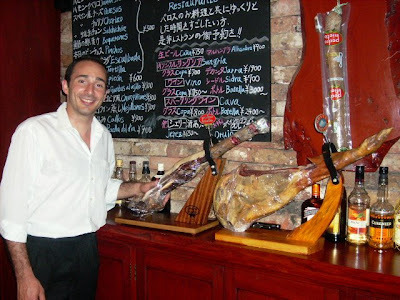 When a request came in, my friend would slice your ham to order. 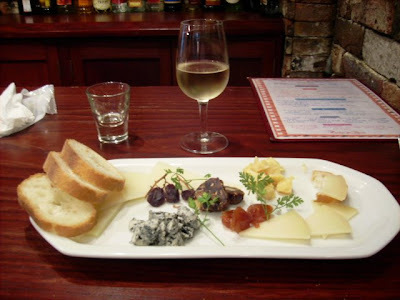 Next on the menu: a selection of cheeses with a fine sherry. I was sopping up the oil with a biscuit! I had a great time at this place. He didn’t speak English that well and my Spanglish needs work, but we had a fine time chatting about this and that. On my last night in Tokyo, I had already done so much walking during the day that I didn’t want to go far. 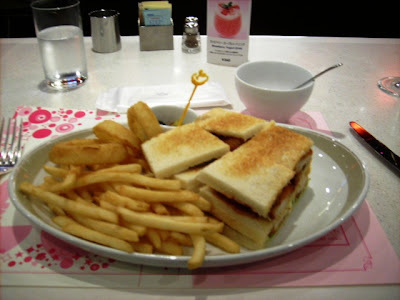 So I stopped at the diner within the Imperial Hotel, and enjoyed the fried prawn sandwich - so good! You can’t believe how a simple sandwich like this can taste so good. At this place, I came to realize something about the Japanese people. I was observing my waiter put together an ice cream sundae. At my seat was a little picture of what he was making, so I knew what the result should look like. He spent 10-15 minutes, painstakingly putting together this treat. The sauce was ladled on just so, the cookies were placed in the correct areas, the chocolate straw inserted perfectly, the strawberry placed at a 45-degree angle. The attention to detail and the pursuit of perfection really hit home for me. Oh and when he was done, it looked like the promotional picture at my seat. Whether it was this waiter, the bellhop, the guy raking leaves at the park, or the bartender, I realized that no matter what the job, whatever level the person, the only thing on their mind is doing that job at the highest level possible, with the highest level of professionalism and pride. I appreciated this and really think Americans can learn from this work ethic and pride in their work. 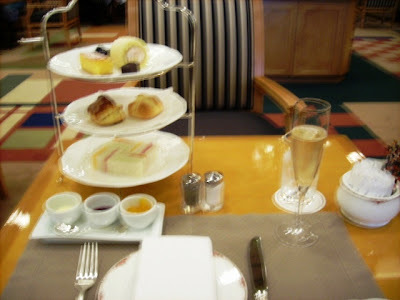 My last day, I had a snack at the Imperial Hotel lobby bar: Champagne, scones and finger sandwiches. There's nothing better than a cucumber sandwich on white with the crusts cut off. I met some really nice people, ate great food, shopped at some fine stores and saw amazing art, shrines and temples. If you ever get a chance, go to Tokyo. It’s expensive, but worth every yen. 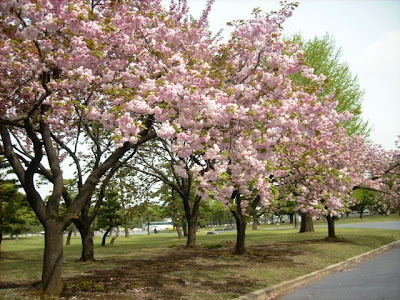 And by the way, I finally found my cherry blossoms - I’m happy! OMG!! 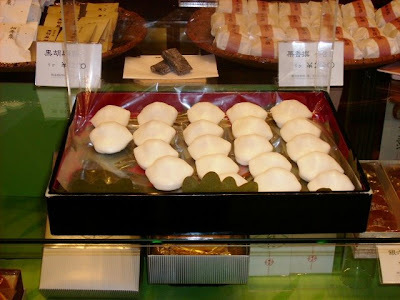 I want to go to Tokyo so bad, I can TASTE it! What a culinary fantasy! It sounds like you had a wonderful, fabulous (and delicious) time. Thanks for sharing! I'm HUNGRY!! !